In my last post I mentioned something about my sweet husband and I getting the rare opportunity to steal away for a night to do something special. Well, I wasn't fibbing. This weekend—on a whim—we planned a little one night reprieve from our day to day happenings. The wine and fruit platter that welcomed us to the B&B. 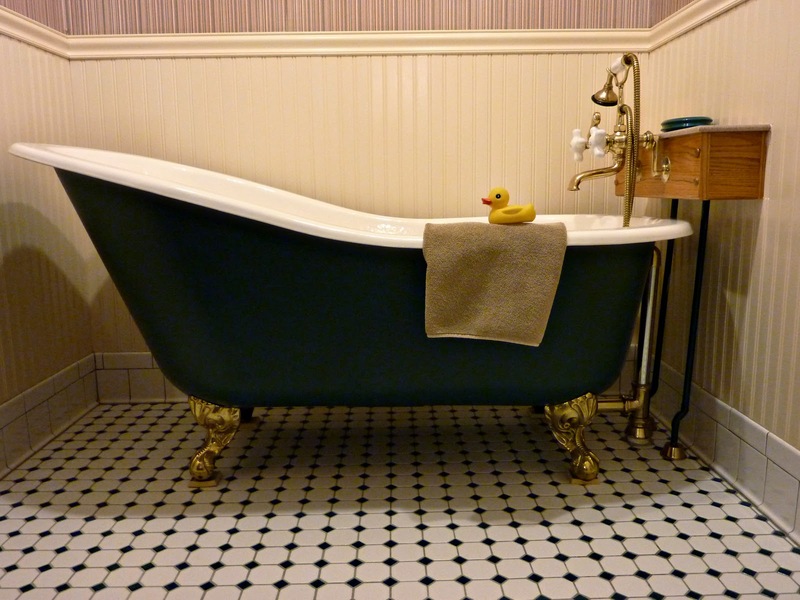 The Clawfoot Tub, complete with rubber ducky. The Victorian stylings of the entire house. 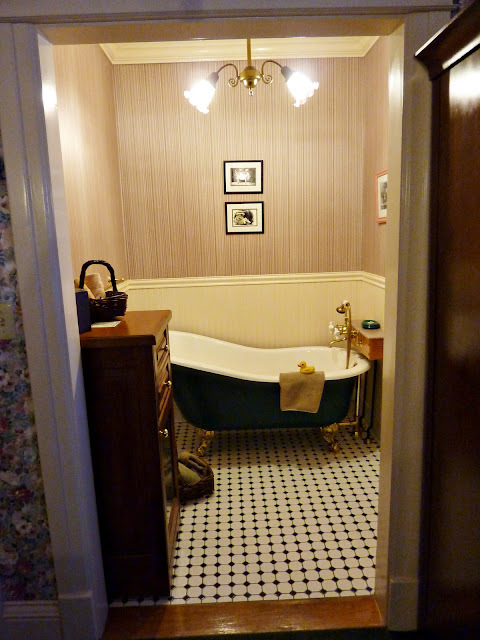 I could have spent all 24 hours in this bathroom if my better half would have let me. I loved every last detail about it. 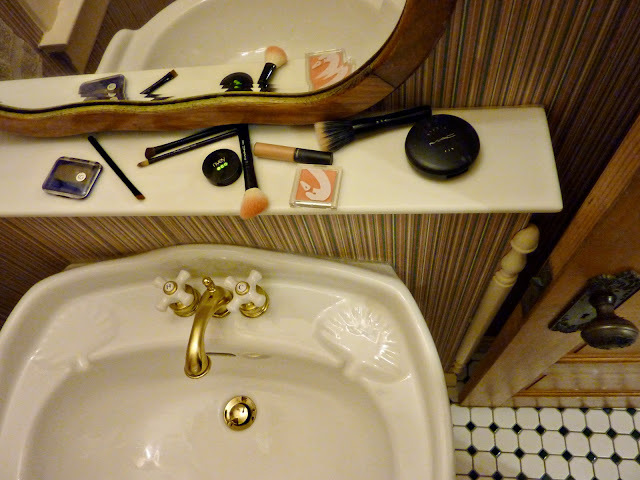 The unique opportunity to apply make-up to my face in complete privacy. 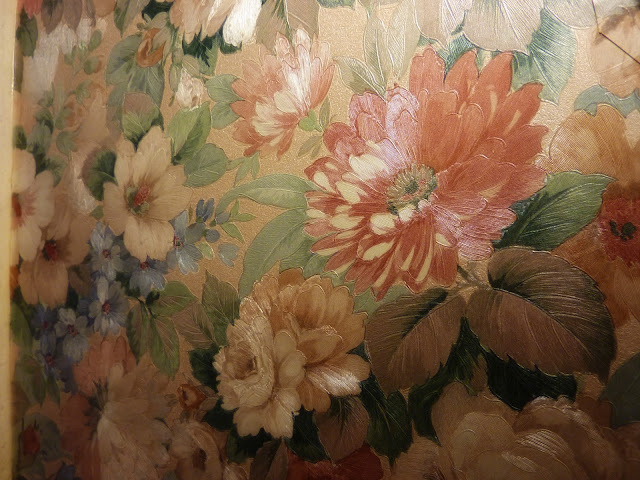 The shiny metallic wallpaper flowers. In my opinion, all walls should glisten. 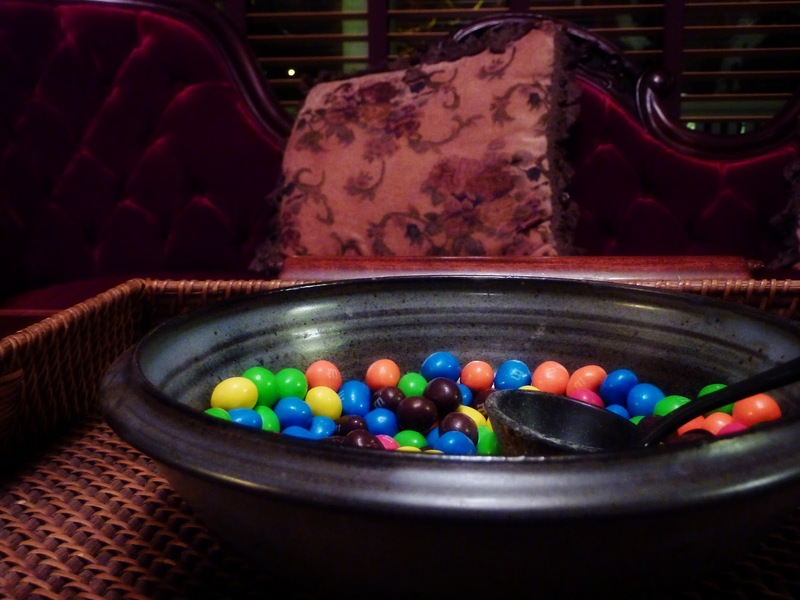 The M&M's that welcomed us back to the B&B after a night on the town. 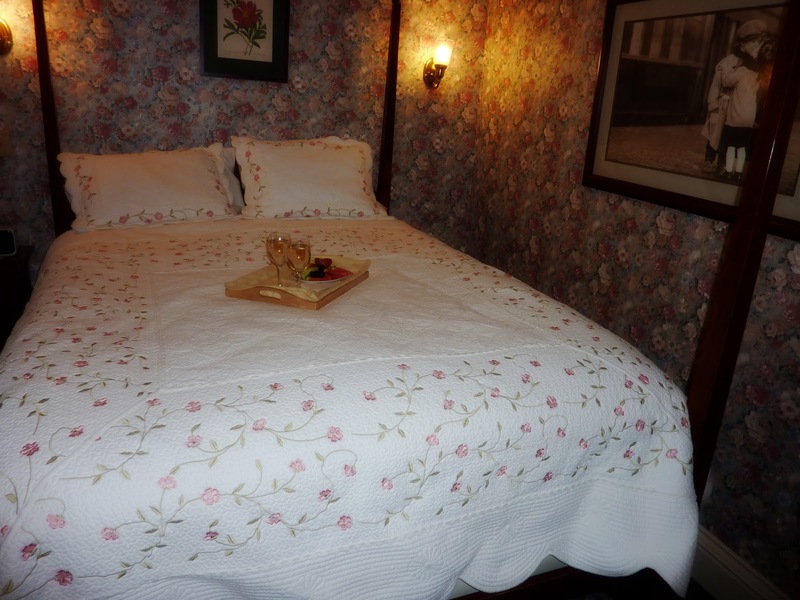 See this bed here? See how tall it is off the ground? Sometime about 3am my darling husband was awoken by what he thought to be a screaming woman in the bathroom. Possibly a masked marauder had broken into the B&B and was up to some mischief in the corner of our tiny room. With all of his manly instincts kicking into high gear, he lunged from the foot of the bed towards the noise. 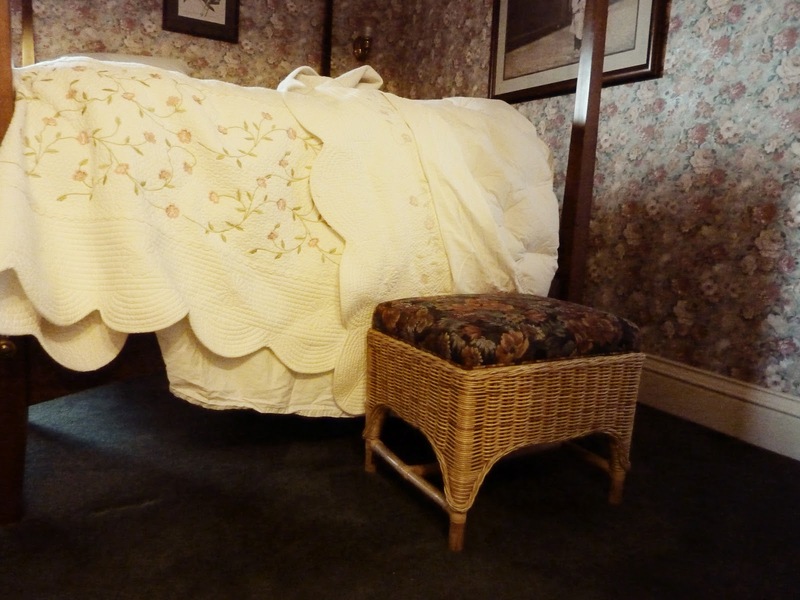 His heroic action did not go quite the way it does in the movies—for there was this little step-stool at the foot of the bed—on which his foot got caught as he made his way to the B&B intruder. 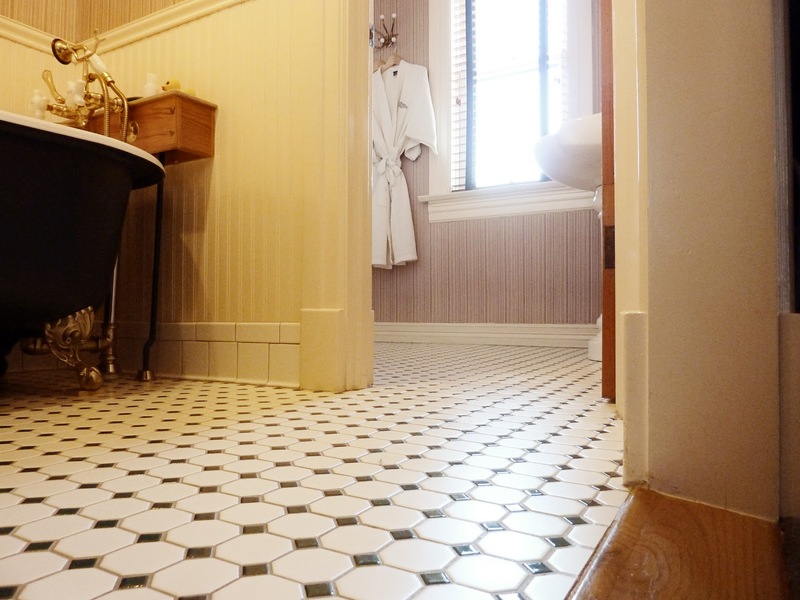 With great force, he landed on all fours, like a tiger ready to pounce on its prey in the center of this tile floor just two feet away from the woman still in distress in the toilet room. 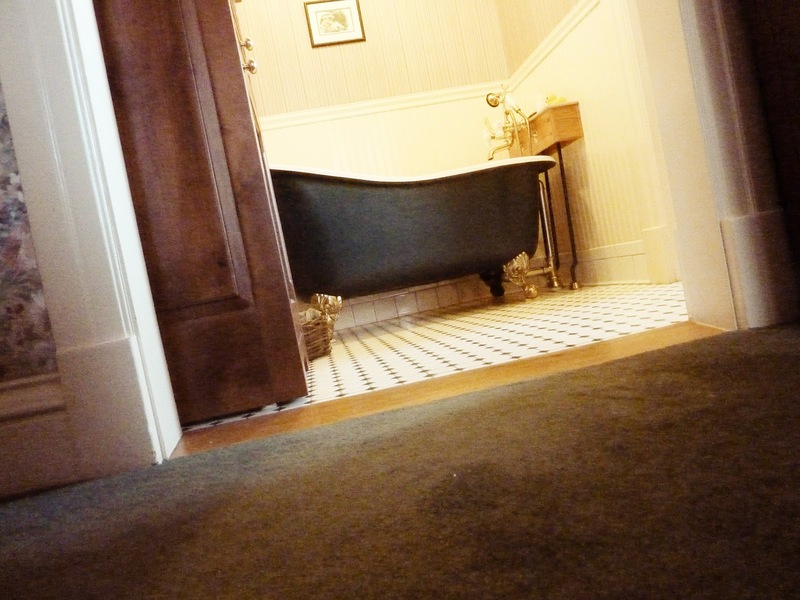 In less than a second he sprung to his feet and swung open the bathroom door. I had gotten up to go pee two minutes earlier. And like any domesticated person might, I flushed the toilet when I was finished. Now I was standing here completely freaked out face to face with my husband who was breathing rapidly and running on pure adrenaline. This whole event took place in less than three seconds flat. "It's me, it's ok, it's me," I pleaded. "What's going on?" I could tell in that moment that he was ready to do some serious damage to whomever was up to mischief behind that door. "Oh my gosh, I thought there was a woman screaming in here. It sounded like someone was getting hurt," he mumbled, still half asleep. "It was the toilet," I told him as we headed back to bed. It took me awhile to get that short phrase out of my mouth, in-between my wild fits of laughter at the obscurity of this whole scene. Such an old building like this has old plumbing, and sometimes it's noisy, I further explained. He was right to think that it was a woman screaming in there though, it was loud and high pitched and probably shouldn't have been flushed at three in the morning in a 10ft x 10ft room. OMG - that is hilarious!